After having acquired the gorgeous Chanel Chamade Cream Blush, I realized it would look lovely with a coral lipstick. But I didn't have one that was quite the right shade. Cue a visit to the department store, and this: Clarins Rouge Eclat in Pink Coral. Oh. My. God. Smooth texture, light pomegranate smell, beautiful pigmentation: I can't say enough good things about this lipstick. And so I've been wearing it a lot with said Chanel blush. The finish is satin and really comfortable. It applies easily and doesn't dry out the lips. It wears quite well for a few hours (or until you eat), and wears off nicely. I am now regretting I never investigated the Clarins lipstick lines earlier. If you need a nice coral that is non-offensive for Spring, don't look any further. 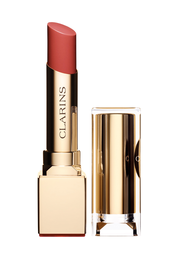 Clarins Rouge Eclat lipsticks are 3g and cost €24, US$ 27. It would look beautiful on you, I'm sure of that!